The milk frother is a simple, quick and clean tool used to make the perfect milk froth with a fine, light consistency for cold drinks such as a frappé latte, frappé chocolate and many more trendy drinks. Find our selection of the best milk frothers brands at MaxiCoffee : Barista & Co, Bialetti, Bodum, Judge and more! 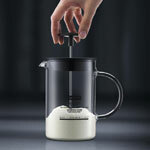 This 1 litre milk frother by Bialetti is the ideal companion for your coffee machine. In just a few minutes you can top your drinks (coffee, tea, hot chocolate) with a beautiful milk foam. This copper-coloured Bodum Chambord manual milk whisk or frother will enable you to create a thick and creamy foam for your cappuccino, latte or moka. 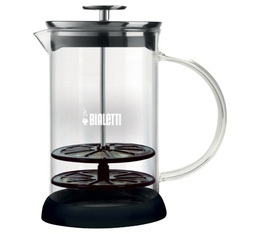 This 1 litre milk frother by Bialetti is an ideal accompaniement to your coffee machine. This Bialetti milk frother is suitable for all hobs, including induction. 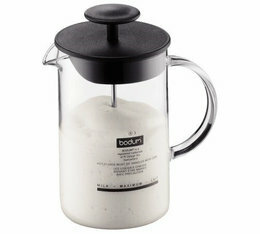 This Chambord manual milk whisk or frother, by Bodum, will enable you to create a thick and creamy foam for your cappuccino, latte or moka. This Judge milk frother is the ideal addition to your espresso machine, so you can make the perfect cappuccino or latte macchiato. Capacity: 40 cl.